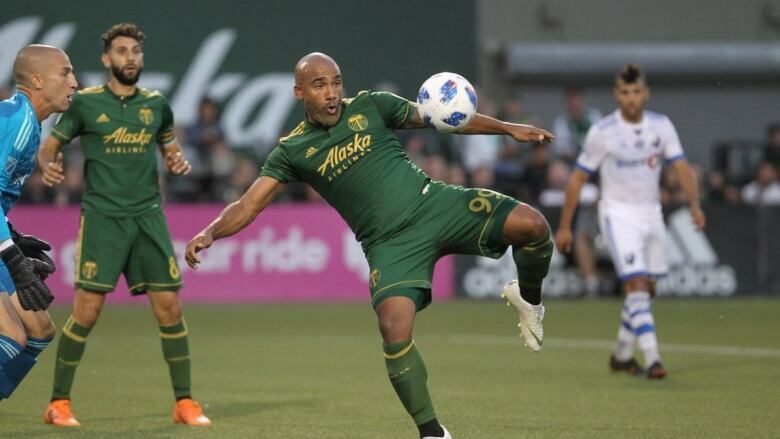 Portland's Diego Valeri scored the lone second-half goal and the Timbers tied the Montreal Impact 2-2 on Saturday night to increase their MLS unbeaten streak to 13 games. Saphir Taider and Matteo Mancosu scored for Montreal in the first half. Portland's Samuel Armenteros had his seventh goal in nine games. It was Impact's first tie in 22 games this season. Coming into the match, Montreal (9-12-1) was the only MLS team without a tie in 2018. Trailing 2-1 at halftime, Portland (8-3-7) turned up the pressure, outshooting the Impact 12-3 during the second half. Valeri broke through during the 64th minute, scoring on a short header off a rebounded shot. The play was set up when Portland's Sebastian Blanco's shot from the left side was tipped away by Montreal goalie Evan Bush. Valeri was well positioned for the rebound, beating Bush to the ball. "Usually we're the team that scores first. Today was a good response. The mentality is good and they keep on showing that," Portland coach Giovanni Savarese said. "Montreal played a good game. They made things difficult. It was a tough opposition." Montreal protested Valeri's goal for several minutes, claiming the Timbers midfielder made contact with Bush. "It was a foul. Without a doubt. I was surprised that the ref didn't whistle," Montreal coach Remi Garde said. Montreal led 2-1 at halftime following a wild finish to the first half. The Impact grabbed a 1-0 lead in the 23rd minute on Taider's goal. Alejandro Silva started the scoring play with a long dribble to just outside the box, where he fed Taider about 10 yards from the goal. Taider drilled a shot just inside the left post to give Montreal the lead. The lead stood until the final six minutes of the first half, when both teams scored a goal. Portland got the equalizer during the 39th minute when a defensive mistake led to a goal. Bush mishandled a shot near the goal line, and the ball fell to the left foot of Armenteros, who finished the close-range shot to tie the game. The Impact countered two minutes later. Ignacio Piatti booted a long ball down the middle of the field to a streaking Mancosu, who easily beat Portland goalie Jeff Attinella with a 15-yard shot to the left corner. Montreal had several chances to widen the lead during the first half, which Garde thought came back hurt the Impact. "We created many chances and when you don't score on so many chances, it can be trouble," Garde said. Both teams return to action July 28 with home games. Montreal faces East-leading Atlanta, and Portland hosts Houston.